Classic elegant beauty, a diamond solitaire. The solitaire engagement ring sets the center diamond or gemstone squarely in the spotlight. Bigger is not always better, brilliant is preferred. Although solitaires are simple in design, there are hundreds of unique different styles classic, antique, modern, cathedral, and sculptured and name a few. We have thousands of brilliant iamonds to choose from in our diamond data base. A diamond solitaire engagement ring is just the beginning of your life long journey, what are you waiting for . . . we have your ring. Check out more great designs HERE. 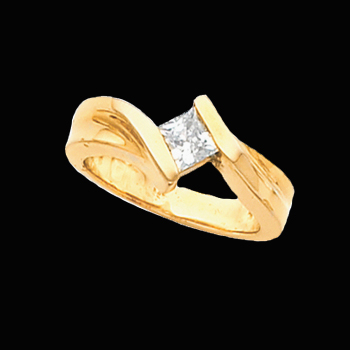 Romantic 14k Gold or Platinum Diamond engagement ring. This engagement ring is set with 1/2ct Si 1 clarity G-H color dazzling diamond. A 1.3mm round accent diamond is set under the center diamond on either side. Check out the video!!! Stunning Engraved diamond solitaire engagement ring. Features include a Trellis setting and engraved design with a milgrain border. Included 1/2 carat diamond is an SI 1- SI 2 G-H color stone. Available in 14k yellow, white, or rose gold. Also available in different carat weights. Very classic stylish design. Elegant 14k gold diamond solitaire engagement ring. Our great price shown is for the 1/2ctw SI 2 H-I color diamond solitaire, order this ring in a 3/4ctw or a larger 1 full carat. Other options include 14k yellow or rose gold, 18k golds, and Platinum. This ring is also available without a center stone so you are able to add your own. A truly beautiful ring. Use our request email for larger diamond pricing. Gorgeous 14k Yellow or White gold diamond engagement ring. Diamond solitaire is complete with a 1/2ct round diamond center. 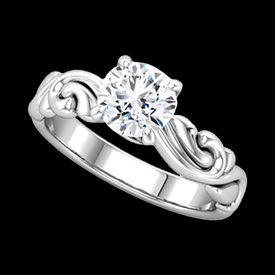 Graceful embossed scroll accents give this solitaire a style all it's own. Stock size 6. Ring is available in Platinum by special order. You'll love this breathtaking engagement ring. We're happy to size this for you but keep in mind sized items are non returnable. Gorgeous sculptural inspired diamond engagement ring. Shown in 14k White gold, this design is also available in 14k yellow or Platinum. Our price shown is for the ring with a 1/2 ctw SI 1 clarity G-I color center stone. If you have your own stone simply purchase the solitaire mounting. **We have thousands of diamonds so email for help selecting a perfect stone for you. Platinum diamond solitaire. Double groove design solitaire engagement ring, price shown with a 3/8ct tw SI 1 clarity G-I color. Any shape or size center diamond available in this great style. Fancy Platinum diamond solitaire engagement ring. Price shown is for a 3/8ct tw SI 1 clarity G-I color center diamond, ring available with any shape or size center. Use our request link for additional pricing. Free ring sizing, simply put your size in the comment box at checkout. 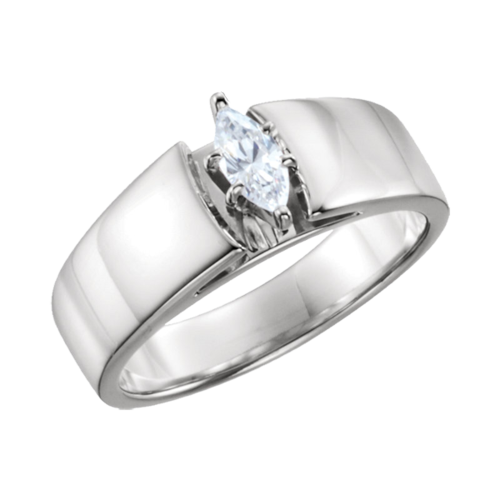 Platinum classic design diamond solitaire. This engagement ring is available with any size or shape center stone, use our request link for additional pricing. Price shown is set with 1/4ct tw SI 1 clarity G-I color center diamond. Platinum diamond solitaire engagement ring. 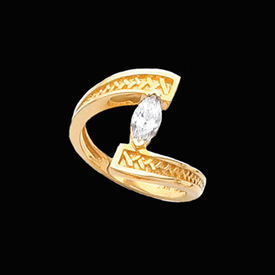 Diamond solitaire ring is available with any shape or size center diamond. Price shown is based on a 3/8ctw laser inscribed stone. Free ring sizing, include your size in the comment box at checkout. Lovely Platinum and 18K Gold Engagement ring is available in a 1/4ct Diamond Solitaire. Diamond measures 4.1mm round and is a SI2 clarity G-I color stone. A Lovely Ring. Platinum knife edge design diamond solitaire engagement ring. Price shown set with 1/4ct tw SI 1 clarity G-I color diamond. Available with any shape or size center stone, use our request for additional pricing. Free ring sizing, add size to comment box at checkout. European design Platinum diamond solitaire. Price shown for this Platinum diamond solitaire is set with a 3/8 carat SI 1 clarity G-I color center. Ring design features the European shank. Available with any shape or size center head, use our request link for additional pricing. Platinum diamond solitaire. 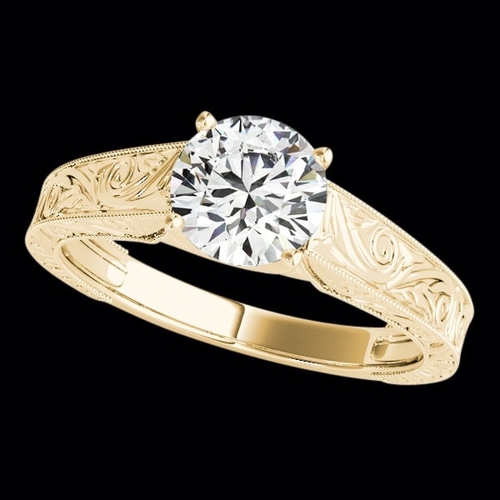 Lovely Antique design solitaire, price shown with a 1/4 ctw SI 1 clarity G-I color center stone. Matching band available with this solitaire. Use our request link for additional diamond pricing, any size or shape available in this ring. Wide Marquise Solitaire engagement ring. 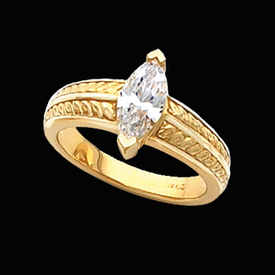 Gorgeous 14k Gold (white or yellow) Marquise Diamond solitaire engagement ring. Center diamond is an SI 1 H in color 1/4ct tw Marquise. Use our special request link for additional center diamond pricing or pricing in Platinum. Price shown includes matching band. Gorgeous Marquise 1 carat Solitaire ring. 14k yellow or white gold ring is set with a 1 carat SI 1 clarity G-I color diamond. Order this ring with an alternate quality center diamond or without a diamond. Custom made to order item. Price will vary depending on center diamond available. Pretty 14k Yellow or White gold Marquise cut diamond solitaire. 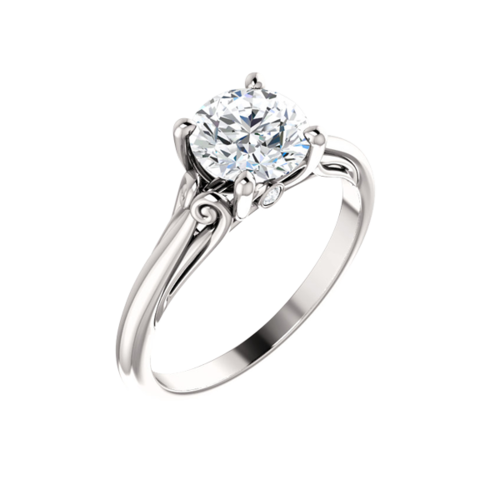 Bypass design features a celtic flair and is set with a 1/2 carat certified conflict free solitaire diamond. Price shown complete for the SI2 clarity G color diamond, alternate qualities also available. Stone measures 8x4mm. Free sizing, add your size to the comment box during checkout. 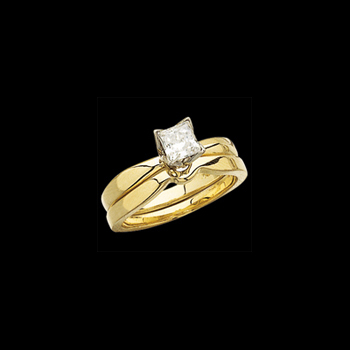 14K Yellow or White Gold Princess Cut Solitaire Tulipset Design. Diamond quality is SI 1 G-H in color and our price shown is for the 1/4 carat ring complete (matching band sold separate). An incredible price so this Princess cut diamond solitaire engagement ring. 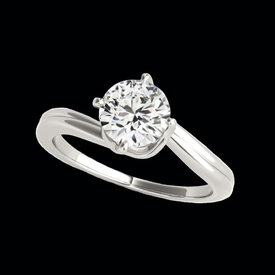 This Lovely Diamond Solitaire is available in a variety of Sizes and diamond qualities, email for additional selections. Fantastic 14k Gold Princess diamond solitaire engagement ring. Heavy bypass design is set with an aprox. 1/2 carat (.45-.55) center princess cut diamond. Ring weighs 6.92grams, measures aprox. 5mm wide. Price shown is for the 1/2 carat SI2 clarity G-H in color center diamond. Exciting solitaire diamond ring. Available in 14k Yellow, 14k White, and Platinum. Free ring sizing, add size to comment box at checkout. Princess Cut diamond solitaire. Beautiful Trellis design princess diamond engagement ring is available in your metal choice and a variety of carat weights. Price shown is 14k White gold set with a .30ct tw SI 1 clarity GH color diamond. Email for additional carat weight pricing. Additional weights include .40ctw, .60ctw, 1ctw, and 1.5ctw. Double prong design Diamond solitaire engagement ring. Princess diamond is 1/2 carat SI 1 clarity GH color stone. Price shown in for 14k White gold, also available in yellow gold, 18kt gold's and Platinum. Design is available as shown in a 1/2 carat size, also a 1 carat and large 1 1/2 carat selection.